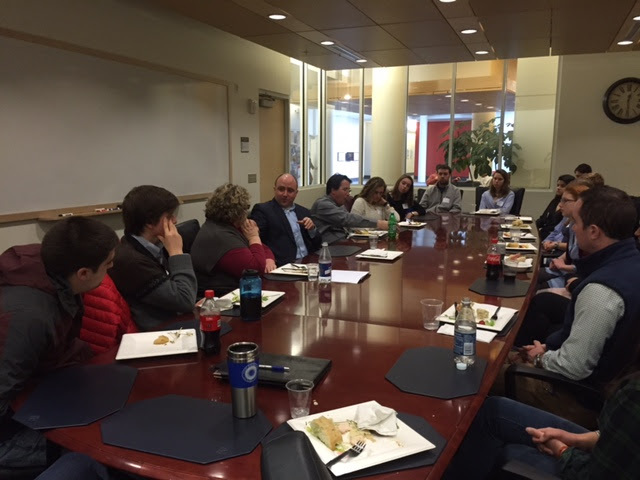 Twenty-one students met with Michael Cuzzi ’98 to hear about his career in applied politics as part of the Goldfarb Center’s True Life After Colby event series. Interacting with alumni gives students opportunities for networking, chances to explore internship and employment opportunities, and insights on what life might be like after their time on Mayflower Hill. In turn, alumni benefit from reconnecting with their alma mater and giving back in a way that is personal and meaningful. This semester, Michael Cuzzi ’98 met with 21 students to share his experiences as a political, communications, and advance veteran of presidential and congressional campaigns. As senior vice president of VOX Global, Cuzzi works with clients in the energy, sustainability, natural resources, and economic development sectors. The informal setting allowed students to ask questions about the obstacles he had to overcome to be successful, what aspects of his Colby education enhanced his skill set, and his advice for those about to embark on their own careers. For more information about the True Life After Colby program, please contact Assistant Director Amanda Cooley at akitchen@colby.edu.